Ted Brown Music in Tacoma has several full time in-house repair technicians that are ready to service all of your instrument repair needs. Whether you just need a simple adjustment or a complete rebuild, our technicians are fully equipped to handle whatever ailments your instrument may have. We are also the warranty service location for all the band and orchestra instruments we sell, and will coordinate any warranty work on everything else. If your instrument isn’t working like it used to, let us know and we’ll get it playing like it should. Chris earned degrees in Music Education and Theory/Composition while studying saxophone at Michigan State University. After a brief foray in public school and private studio teaching, Chris took an apprenticeship at Meridian Winds in East Lansing, MI. Chris has worked for Don Wilson Music Co. in Lexington, KY and has been shop manager at Ted Brown Music Co. in Tacoma WA since 2001. Chris is on the board for Renton Technical Colleges Band Instrument Repair Class, is a substitute instructor for the class, gives local and national clinics on maintenance and repairs and is an active saxophonist in the Tacoma area. Chris is certified to repair flutes with Straubinger pads. 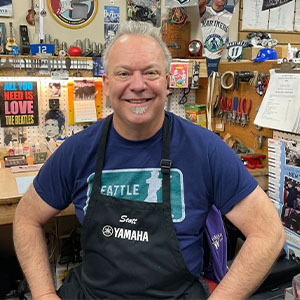 Scott has been repairing instruments at Ted Brown Music since 1992 and is a graduate of Renton Technical College. Being a guitar player, Scott originally wanted to build and repair guitars but soon found out he really enjoyed fixing woodwinds and brass. Away from work Scott likes to collect Beatles memorabilia, play jazz and blues on his guitars, and spend time with his wife and two daughters. Jeff joined Ted Brown Music in August of 2009 delivering instruments. In April 2011 he began his apprenticeship in instrument repairs. He has enjoyed learning and developing his new skills. This is a second career for Jeff, he is a retired Teamster of 30 years. His favorite things to do are golf and spending time with his family. 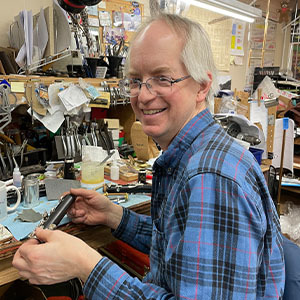 Roy Dilley has been repairing brass and woodwinds since 1999. He is a graduate of Renton Technical College and has worked in shops in Chicago and Davenport, Iowa, as well as the Seattle area. Roy is a graduate of PLU’s music department with a BMA. He is a saxophonist and woodwind player, and has been active as a performer and private instructor. He has studied with many area musicians, notably Greg Sinibaldi and Don Lanphere. When Roy is not at the bench or behind the stand, he is an artist and collector of mid-century modern objects and furniture. Caitlynn Akehurst graduated from Tacoma School of the Arts with an emphasis on piano performance and songwriting in 2011. She had joined Ted Brown Music as a sales associate in 2010, and when there was an opening in the shop to help out, she started doing simple string repairs and decided that instrument repair was for her. 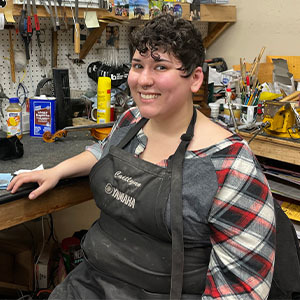 She has been a full-time apprentice in the shop since the fall of 2013 and has so far worked successfully with strings, brass, and small woodwinds. In her free time, Caitlynn creates textile crafts and natural skin care products and she enjoys exploring Tacoma’s Point Defiance Park. Ian graduated from the University of Idaho with a Music Performance degree in flute in 2012 and completed the repair program at Renton Technical College in 2014. He enjoys performing classical, orchestral and chamber music, as well as traditional Celtic music and is currently a member of the Seattle Festival Orchestra. During his free time, he composes chamber music, plays the mandolin, kayaks, hikes, and plays board and card games with his friends. 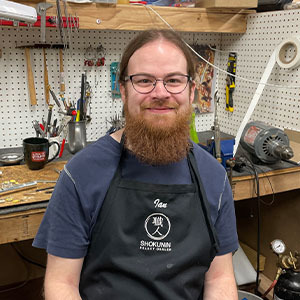 Steve graduated from Red Wing Technical College in Red Wing Minnesota, where he studied Guitar Building and Repair, and Violin Repair and Restoration. He also spent time as a bow-makers apprentice. 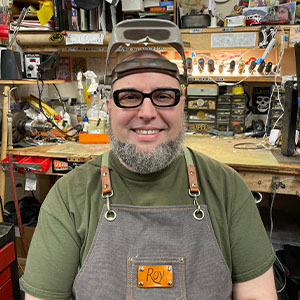 Prior to joining Ted Brown Music, Steve worked at a number of quality repair shops in New York, Philadelphia, and Seattle, eventually opening his own repair shop on Bainbridge Island in 2006. When he's not working on instruments, he enjoys playing music with friends, and spending time with his family and first grandchild - a baby girl.